With holiday spending growth predicted at its lowest level in six years, consumers are cutting corners on everything from presents to parties. Instead of reaching to call the caterers or serving pre-packaged hors d&apos;oeuvres, whip up inexpensive appetizers that rely on farm-fresh ingredients and local produce that you can find in your own backyard. Cut pumpernickel into 2" squares, then one cut diagonal to form triangles. Lightly toast off the pumpernickel triangles at 375 degrees for 3 minutes. Whip together 8 oz. of cream cheese with 2 oz. of honey (Fiore&apos;s uses sourwood honey from the local farmers market). Place mixture in a pastry bag with small star tube tip. 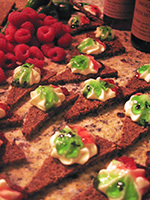 Pipe cream cheese mixture onto each pumpernickel square, then spoon hot raspberry preserves and green pepper jelly on both sides of the cream cheese. Soften cream cheese. In a bowl mix cranberry, apple and pumpkin puree (Bistro 1896 uses locally grown apples and pie pumpkins). Lay out wonton wrappers. 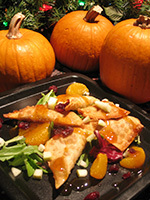 Divide cream cheese and the pumpkin, cranberry and apple mixture in the center of each Wonton. Sprinkle cinnamon and brown sugar to taste. Lightly moisten the edges of each Wonton wrapper and fold them into triangles, then fold back the long ends of the triangle and pinch together. Fry Wontons in 350 degree oil for 5-6 minutes. Take out of oil carefully and drain excess oil from Wontons. Let rest a minute or two then eat! In a pot, combine honey, orange slices and cook over medium heat until thickened, stirring often (Bistro 1896 uses local Haw Creek Honey). The following free holiday events offer another low-cost way to experience the holiday flavors of Foodtopia. More information on culinary adventures in Asheville at FoodtopianSociety.com. Asheville Seasonal Sizzle: Enjoy 21 days of not-so-silent holiday nights as Asheville&apos;s nightlife explodes with holiday magic during Seasonal Sizzle in December. Merrymakers will enjoy holiday firework displays, live entertainment, appetizer specials at local independent restaurants, and extended hours of evening shopping in downtown&apos;s eclectic boutiques and craft galleries. Seasonal Sizzle at Seven Fireworks: Saturdays, Dec. 6, 13 & 20 at 7 p.m.
National Gingerbread House Competition: The National Gingerbread Competition at Grove Park Inn Resort & Spa attracts competitors from around the country who create colorful confectionary and architectural wonders. Delight in the imagination shown in these creations from sugar-and-spice castles to gum-drop covered chimneys. Gingerbread creations will be on display at The Grove Park Inn Resort & Spa and at The Grove Arcade public market from Nov. 17 to Jan. 11. Holiday Tailgate Markets: Asheville&apos;s many tailgate markets get a holiday makeover in December with seasonal offerings of locally made foods, stocking stuffers, holiday treats and handmade crafts. Enjoy holiday shopping, live music and Silverbelle the Rein-Goat at The Asheville City Market Holiday Bash on Dec. 6, 13, 20. For more holiday tailgate markets visit FoodtopianSociety.com. Named by Frommer&apos;s as one of the world&apos;s top 10 must-see destinations for the blend of cultural and natural allure, there is also a must-taste side of Asheville. With 17 farmer&apos;s markets, 135 independent restaurants and a bevy of local breweries, the Asheville area is a culinary paradise. Mild winter weather offers scenic snow-capped mountains while downtown Asheville remains navigable and festive for holiday visitors.